From Drones at Everest to Robots on the Moon! Kapil, Samjhana, and I visited the Astrobotic High Bay, in Pittsburgh, Pennsylvania, where work is being done on the commercial lunar lander, PERRIGRINE, and on advanced quadcopters. We received a fascinating briefing from the Lunar Mission Director, Sharad Bhaskaran. 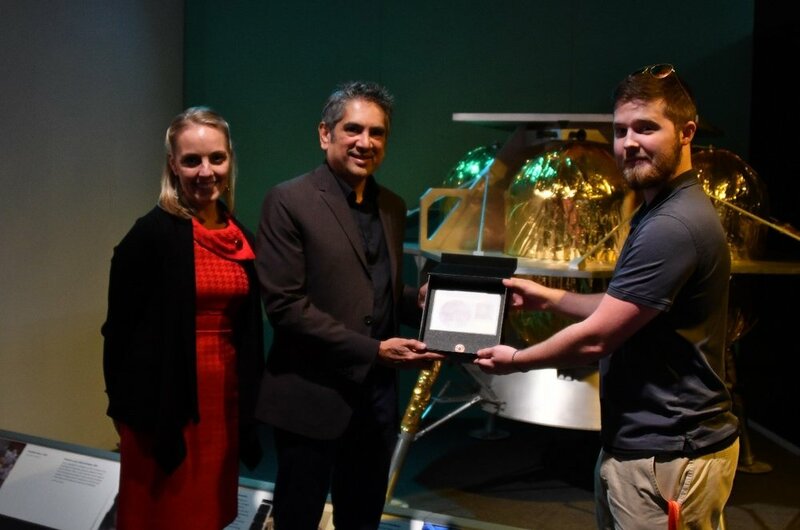 At the local museum, where a full mockup of PERREGRINE is on display, I presented to my adviser and Astrobotic General Counsel, Justine Kascnica, and Mr. Bhaskaran, the Nepal Robotics payload, which includes a fragment of Everest Summit rock. In the rock are fossils of sea lilies dating from the ocean floor 400 million years ago, that rose up to the Everest Summit some 40-50 million years in the past. Soon, those fossils will evidence, forever on the Moon, an ancient lifeform from Earth! This payload complements the one developed at Kanjirowa. Kapil, Samjhana, and I also had a meeting at The Robotics Institute of Carnegie Mellon University with William (“Red”) Whittaker, “The God of Robotics,” where we discussed STEM activities at Kanjirowa and plans, there, for the future. That was thanks to Justine and Nepal Robotics adviser and U.S. Navy pilot and NASA Astronaut Bill Readdy. To complete our mission, we visited the Citizen Science Lab, where its President and CEO, Dr. Andre Samuel, told us about the Lab’s STEM program, which includes drones, and we briefed him on Kanjirowa’s activities. In Washington, D.C., after I returned to college for exams, Kapil and Samjhana met with Sean O’Keefe, former Administrator of NASA, Professor at Syracuse University, and Director at the Center for Strategic and International Studies. Like Red Whittaker and Andre Samuel, Mr. O’Keefe was genuinely interested in STEM work at Kanjirowa and he made some great suggestions for how that effort might be enhanced. The next day, Kapil had a productive teleconference with Mr. Bryan De Bates, Vice President for Education at the Space Foundation about the organization’s outstanding STEM programs. This followed hours-long, preparatory conversations that I had with Bryan. Finally, Kapil met with Aliyah, to continue planning for a five-day 2019 Teachers Take Flight seminar to be organized and hosted by Kanjirowa. I participated by Skype. The Kashmir World Foundation program, which follows similar ones in 2016, 2017, and this year, will instruct teachers how to design, construct, program, and operate drones, so that these skills can be passed along to students throughout Nepal. We have high hopes that important, new, U.S.-Nepal STEM programs will eventuate from our mission to Pittsburgh, the meeting in Washington, the teleconference, and the Skype call. Some background: The Astrobotic lunar landing mission is planned for 2020. PERRIGRINE will be launched from Kennedy Space Center on a United Launch Alliance Atlas V rocket, which has a perfect record of successfully lofting more than one hundred commercial, civil, and national security missions. I’ll be there, when Atlas V lights up the launch pad, and I’ll bet my friends from Kanjirowa will be there, too! I want to thank Astrobotic CEO, John Thornton; Board Member, distinguished NASA astronaut and Naval aviator, Bill Readdy; and distinguished attorney, Justine Kasznica, for making all this possible. 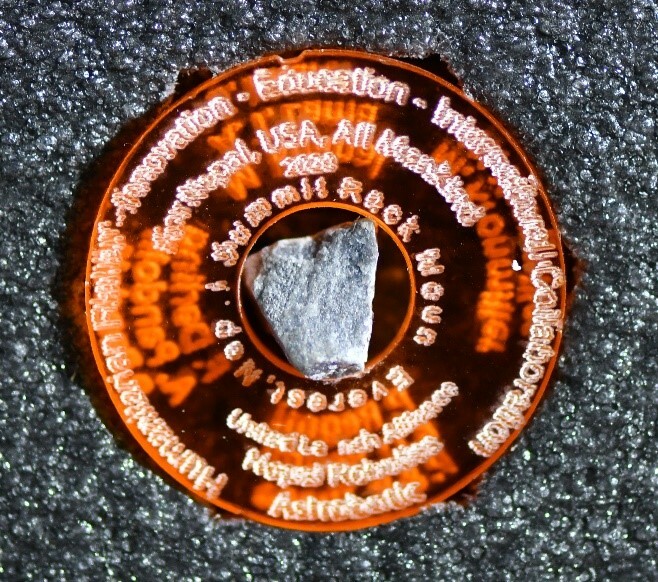 Former NASA Astronaut, Dr. Scott Parazynski, inspired the Nepal Robotics lunar lander payload, by taking a moon rock to the Everest Summit, as reported on scene by Mr. Keith Cowing. Moon pioneer, Buzz Aldrin -- my personal friend, of so many years -- and Charlie Bolden, former NASA Administrator, carried the message of space exploration and STEM on visits to Nepal from America, thank you! Remember, Bill, Justine, Scott, and Keith are on the Nepal Robotics Advisory Board, and I cannot imagine how the robotics project could have happened without them and the other Advisers: in the USA, Dr. John Langford, Dr. Sandy Magnus, Dr. Athina Balta, Dr. Mark Patterson, Dr. Mary Lynne Dittmar, Dr. Ruth Wittersgreen, Dr. Ronald Pandolfi, Princess Aliyah Pandolfi, Mr. Michael Lowell, J.D., Mr. William Dranginis, Mr. Robert Johnson, and of course, my brother, William Rory; and in Nepal, Mr. Kapil Regmi, Mr. Puspa Regmi, Mr. Jeewan Khadka, Ms. Samjhana Kharel, Mr. Umesh Acharya, and Mr. Abhisekh Dewan. I am grateful, as well, to heroic mountaineer and distinguished Board Member, Ang Tshering Lama, who carried the payload rock down from the Everest Summit and donated it for the Nepal Robotics lunar lander mission. Remember, too, Ang plans to take my CAD-designed, 3-D printed drone, assembled and programmed by Kanjirowa students, to Everest Camp 3, and maybe higher, for flight tests. I thank Prem Thapa, my friend and guide, who has been with me in Nepal, from the very start, and who is working with me on a soon-to-be-completed, ambitious book, Drones of Everest: The Garuda Project. And, of course, I thank Kanjirowa for allowing me the singular privilege of such a wonderful, truly far reaching, STEM collaboration. I remember, with deepest respect, the late Gene Cernan, the last man on the Moon, whose friendship with me and historic achievements have been at the very heart of the Nepal Robotics Project. In June of 2017, I traveled back to Nepal where I successfully flew my fully modular drone, Lotus, at Kala Patthar, 1,000 feet above Everest Base Camp and over 18,500 ft above sea level. I also collaborated with students at Kanjirowa to teach them about 3-D printing their drones, to take advantage of the low cost and ease of modification and repair. I met with Sherpa mountaineering rescuers, including international hero, Ang Tshering Lama, who offered to take my new, ultra-high-altitude, modular drone up the Khumbu Icefall to Everest Camp 3, at 23,000 ft, and perhaps above, for further flight testing. I was honored to help open the STEM Lab at Kanjirowa, the first such dedicated high school facility in Nepal, and to meet with key Nepalese and U.S. Embassy officials for consultations on further steps to broaden STEM education in Nepal.